Weddings and receptions at The Westin Resort & Spa, In Hilton Head, Sc, are amazing with their grand ballroom for your reception with exquisite chandeliers it is so inviting and the carpet with decor on them is even more beautiful. Photographing any wedding reception can at times be very tricky, and if you are a single shooter, witch I am most of the time, you have to be very organized in your timeline. For this wedding reception detail image at the beautiful Westin Resort & Spa in HHI, I had already photographed the family and couple, witch gave me a good 15 minutes before all of the friends and family and the bridal party got invited in.When I walked in this ballroom I blown away of how beautiful this reception ballroom set up was, that the Westin Resort & Spa staff and coordinator put together. I loved the uplighting of the purple hue. 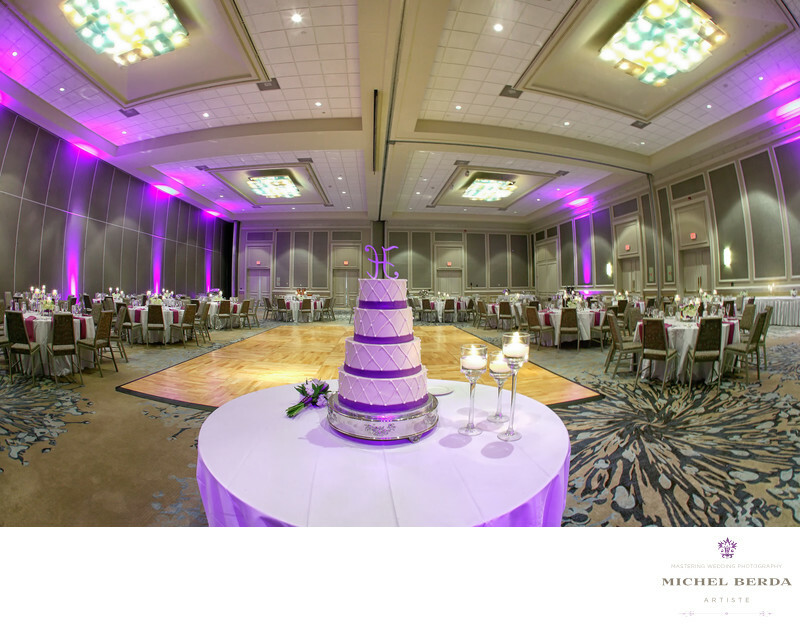 Has I stood back more and more from this ballroom, I realized that with my fisheye, I could capture it all while putting the cake in the middle as a focal point The result of this image is perfect. This images gives the clients a great memory of this beautiful evening, how well decorated and large this ballroom really was at this amazing venue The Westin Resort & Spa in HHI, Sc. Keywords: Wedding At Westin Resort & Spa (3).